If you have clear skies and live in the northern hemisphere, you should have no trouble spotting the waxing crescent moon and the blazing planet Jupiter after sunset, but the planet Mercury is a different story altogether. At mid-northern latitudes around the world tonight, Mercury follows the sun beneath the horizon around 45 minutes after sunset. The moon and Jupiter stay out until after dark. If you are blessed with crystal-clear skies and an unobstructed horizon in the direction of sunset, you might see Mercury – the solar system’s innermost planet – in the glow of twilight around 30 to 40 minutes after sunset. However, you will probably need binoculars to catch this world, and even with binoculars, it will not be easy. Later this month, you will see Mercury with relative ease – that is, if you live in the northern hemisphere. 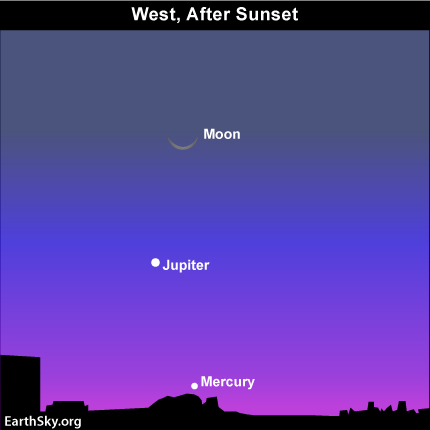 For the next few weeks, Mercury will climb higher and Jupiter will sink lower in the evening twilight. The two will meet around mid-month, at which time Jupiter and Mercury will set about 80 minutes after the sun (at mid-northern latitudes). Even if you cannot see Mercury with the unaided eye around then, look at Jupiter with binoculars to spot Mercury nearby. Mercury and Jupiter will be on stage within the same binocular field of view from about March 12 until March 18. Site contents copyright © 2019 Recorder Online	except as noted. All rights reserved. | 88 queries in 2.262 seconds.